These burgers, I have so many words for these burgers. First of all, the colors and flavors just make me happy. These burgers are so bright and fresh, while still maintaining their hearty deliciousness. I have been dying to show you these burgers, but wanted to wait until closer to summer. Now that Memorial Day is actually upon us (how can that be? ), I am so excited to share! Speaking of which, what are you guys up to this weekend? Anyone have fun cookout/camping plans? Any fun summer kick-off parties? Please tell me that whatever you are planning there will be plenty of burgers, corn and watermelon. I feel like it wouldn’t be Memorial Day otherwise. I am starting to think that this Memorial Day a road trip may be in order. I know that to most of you, snow on Memorial Day does not sound possible. Sadly, where I live, it is entirely possible. In fact Tuesday night and Wednesday I am told we received a foot of snow. BUT…the good thing about living in the mountains is, you can always come down. Denver can have a completely different climate than the mountains. Snowing in the mountains and 75 and sunny in Denver…both at the same time… are completing possible. My mom kids that they are taking a trip to Florida for the day when spending a Saturday in Denver. Unfortunately, I don’t get down there very often. My parents, while really my dad – with my mom and Asher in tow, are the pickers who travel around Colorado in search of props. I’m starting to realize this may just be their excuse for seeking warmer temps. After spending these last couple days in Cali, I’m thinking I either need to join them or go crash on my aunt and uncle’s couch in Ohio with my brother. At this point, anything is sounding better than the snow. Just a little FYI here, I am heading back home today. That means I will be playing catch up on comments and emails. Incredibly sorry if I have left you hanging. My laptop is basically not functioning. I think I have a virus because every time I click on anything I get a pop up. I need to make a run to the Apple store for sure, but that’s easier said than done. I promise to respond to everything in the next couple days, thanks for bearing with me! 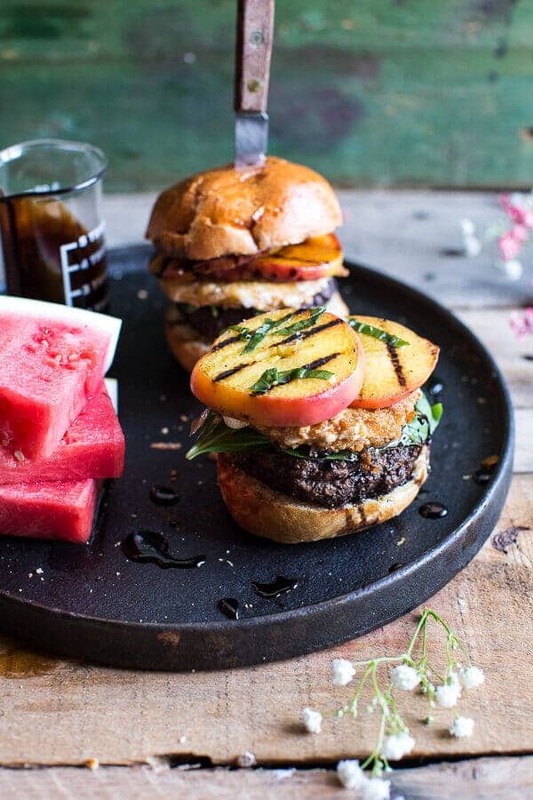 But let’s talk about these mozzarella and caramelized peach caprese burgers. The idea originated from this nectarine caprese salad I made a couple of summers back. Basically the thought was to turn those flavors into a burger, but most importantly, to include the fried mozzarella because the mozzarella makes the burger. Also, I have not a clue how I found such delicious and ripe peaches this early in the season, but I was so excited that I did. 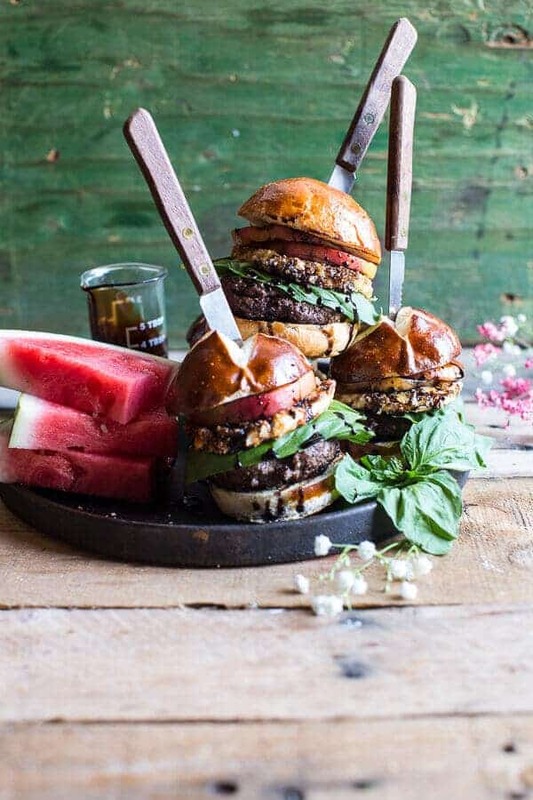 Double also, this burger will keep on getting better throughout the summer months as the peaches just keep getting better and better… from sweet to sweeter. I know that putting a piece of fruit on a burger sounds a little odd, and maybe it is, but I promise this is so good. Think of it kind of like a fruit salsa smeared on a grilled steak, you’d be into that right (I so would be)? 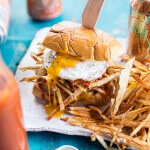 Pretty similar concept, but in burger form, and with fried mozzarella (oh my gosh, yes!) and basil (double yes!). So you see, I feel like it’s not really that weird, but then again, I am me and I’d put fruit on pretty much anything…except chocolate of course. You guys all know I am serious about my chocolate and rarely mix it with fruit (with the slight exception of bananas…sometimes). 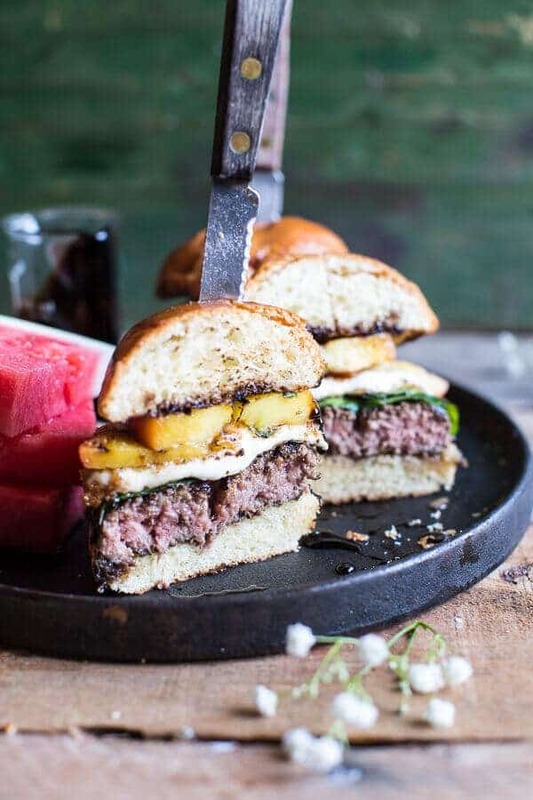 I will not lie though, as much as I love the sweet caramelized grilled peaches, the fried mozzarella is where it’s at, the cheese completely sets this burger apart. Especially when paired with the balsamic seasoned beef and the fresh basil. Honestly, it is so good. I wish I could have gotten a picture of the complete gooeyness of the mozzarella coming right off the pan, but regrettably I work about as slow as molasses when it comes to photo taking. I blame this on my “every photo has to be perfect” mentality. UGH. Thankfully for you guys, you can make the mozzarella yourselves and experience the crisp on the outside, gooey on the inside, deliciousness for yourself. Which will be much better than any photo anyway! Also, these burgers are really fast to make, so they are perfect for a quick summer weeknight dinner or a weekend BBQ. My one request is that you at least make the fried mozzarella, add the basil and then add some form of sweetness. If you cannot find peaches, try adding pineapple, mango, or even diced strawberries would be delicious. Really any fruit you love will work great. Trust me, the combo of savory and sweet is SO good. Fried Mozzarella and Caramelized Peach Caprese Burger with Balsamic Drizzle. These burgers are so bright and fresh, while still maintaining their hearty deliciousness. Preheat the grill or a grill pan to medium high heat, once hot, season the burgers with salt and pepper and then grill until your desired doneness. About 4-5 minutes per side for medium rare. Remove the burgers from the grill and and cover with foil to allow the burgers to rest while you fry the mozzarella. To assemble, divide the burgers among buns. 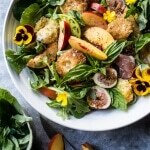 Top with a couple fresh basil leaves, a slice of fried mozzarella and a couple slices of caramelized peaches. Drizzle with balsamic glaze. Add the top bun. EAT! *To slice the peaches in circles, you just slice until you get to the pit and then switch to the other side and again slice until you hit the pit. Then once you can see the pit on both sides, you just cut around the pit in a circle. And don’t forget the watermelon…summer weekend staple. 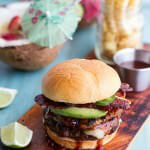 Aloha Burgers with Island Jerk Pineapple. Love that this burger seems quick to make, yet it retains your signature let’s add tons of fruit and ooh cheese vibe (: Hope you had/are having a great time in SoCal! Beautiful! 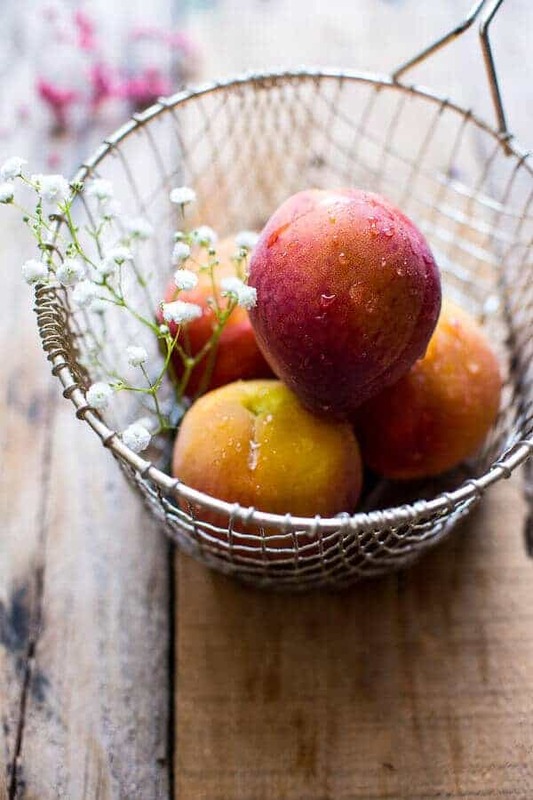 Those peaches look incredible! And mixed with the fried mozzarella? Perfect! What a fabulous combination. 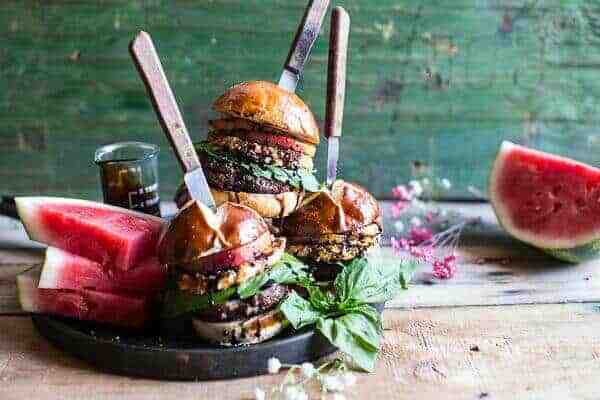 Fruit on burgers is TOTALLY my jam! Especially when that ooey gooey fried mozzarella enters the scene! These are incr-EDIBLE! Also, I am also as slow as molasses when it comes to photo time. Glad it’s not just me! Pinned! Oh man I could no imagine snow right now! But luckily a drive to sunnier weather is not far away! And fruit on my burger? Totally my thing. Oh man, T! These are incredible. Just how I like my burgers – a little savory and a little sweet. Perfect for Memorial Day. I can’t believe it’s Memorial Day all ready. Part of me feels like summer is all ready flying by, but then it’s barely even begun! I always get excited to see what new kind of burgers you imagine for the summer months, and you did not disappoint! 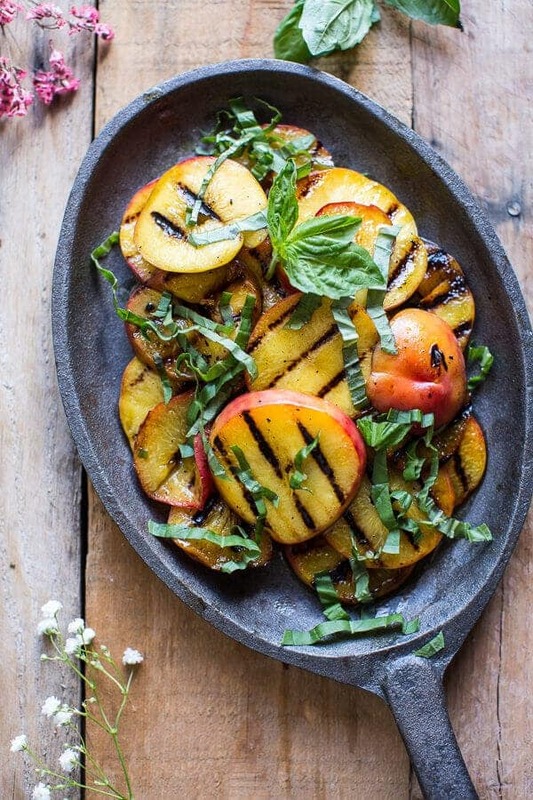 Love the addition of the grilled peach! Oh.my.word. This looks insane and I’m all for it! I have never heard of an Apple computer getting a virus. Mmmm, perfff for a summer BBQ! Damn girl you know how to make a burger! I am swooning for this! Please open a restaurant!! This looks insane! Gorgeous photos and fun recipe! I didn’t know that you could fry mozzarella, so that blew my mind. 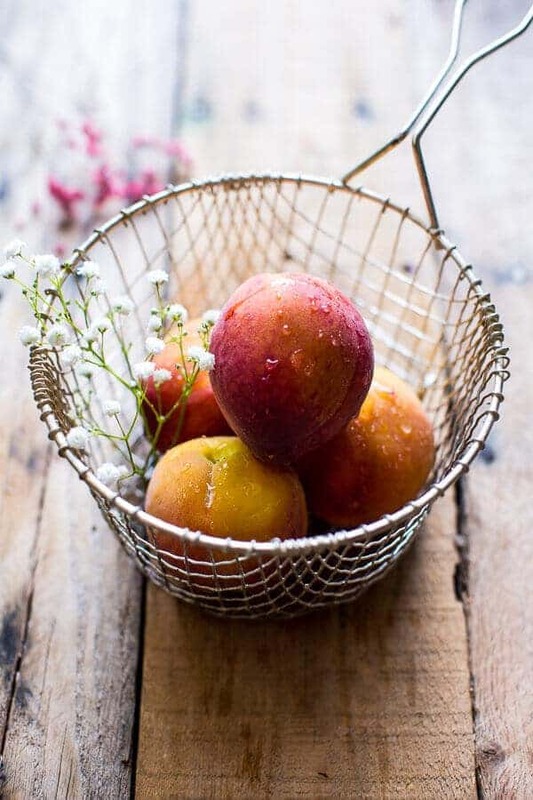 I really love those peach pics in the basket- so fresh! Thanks for sharing your creativity! I share your picture mentality but some of the best pics are raw and messy, I like those 😉 Awesome job Tieghan..I’m looking for a house beside you stat! You get me every time! With your recipes and your photos. I want that burger now. amazing! These are GORGEOUS. I’m drooling! It was SO fun to meet you this week, I feel honored to have been able to pick your brain even just a little bit!! Hope to keep in touch, I can’t wait to see more recipes! This one is so perfect for memorial day! Thanks again and yes, lets keep in touch! your burgers make me sad I don’t eat meat! haha do you have a good vegetarian burger tat I could replace the meat with? This is my dream burger, Tieghan! 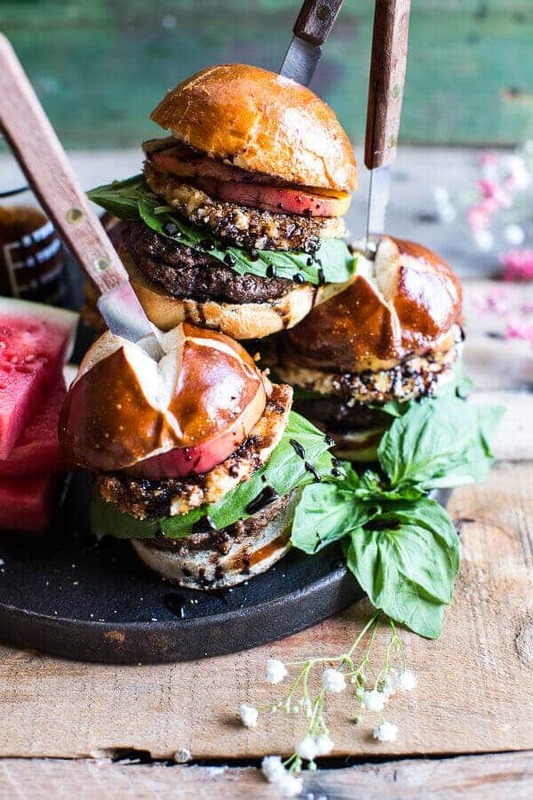 I love caprese (so smart to stack it on a burger) and those brioche buns are just the best! Grilled fruit is where it’s at in Australia for autumn. There’s nothing like the combo os savoury and sweet smokey fruit! I love grilled pineapple with chicken burgers, but this sounds divine! 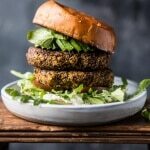 I simply cannot describe how amazing these burgers sound! 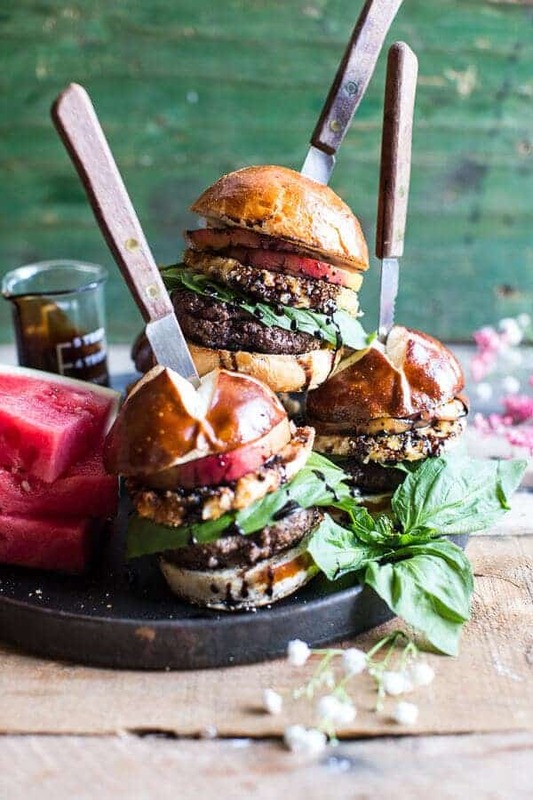 I already love anything Caprese and combining that with grilled peaches on a burger is just the best idea. I am so going to make these! Peaches sound AWESOME on a good, beefy burger. Whoa! perfect, but is hard to find peaches here,, maybe i can replace with pineapple? 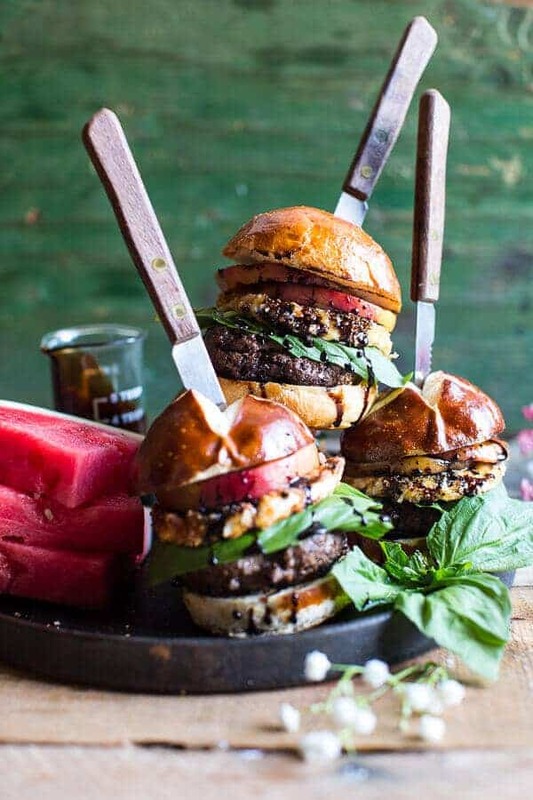 Oh wow, these burgers look AMAZING!! I need to find some good pretzel buns now so I can make these! Thanks so much! Hope you love the burgers! 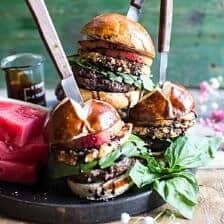 These burgers look amazing! I am so thrilled it’s finally peach season again! I’ve been buying them and we’ve been eating them like crazy! This is the perfect thing to do with them. We’ll just have an all peach night and have peach cobbler for dessert too! We just ate this! It’s really good! I can now add hamburgers into the dinner rotation! Thanks so much!! SO glad you loved the burgers! I’m a little late to stumble upon this recipe. This sandwich unbelievable!!!! Thank you! So glad you enjoyed it! Thanks Jani! So glad you liked it Jani!